As if Amazon Wireless selling Windows Phone devices for pennies wasn’t enough, now they give you a $25 gift card for purchasing a new one! From May 30, 2011 to June 30, 2011 you will receive a $25 Gift Card code for your Windows Phone purchase via Amazon Wireless. Most Windows Phone devices available on Amazon Wireless are already listed at a price of $0.01 (with new 2-year contract). If you’re looking to upgrade take advantage of this deal, Amazon is essentially paying you to buy a Windows Phone, just worth a penny to you. You will also receive FREE two-day shipping on all phones. Some might say it’s a bad thing that the phones are selling at such a low price, but with the over 500 features coming to Windows Phone later this year it will be an incredible device to own. 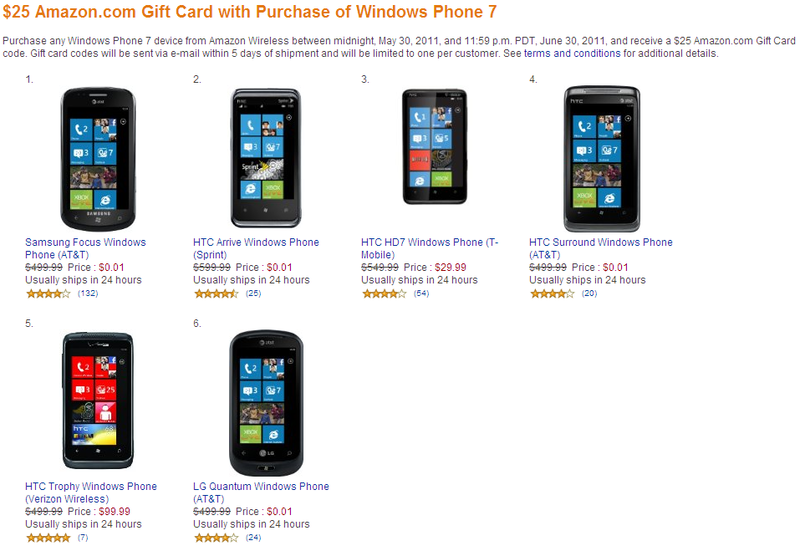 Purchase any Windows Phone 7 device from Amazon Wireless between midnight, May 30, 2011, and 11:59 p.m. PDT, June 30, 2011, and receive a $25 Amazon.com Gift Card code. Gift card codes will be sent via e-mail within 5 days of shipment and will be limited to one per customer. See terms and conditions for additional details. Let us know in the comments if you couldn’t resist this deal and bought a new Windows Phone!